Richard Glover conducts a heartfelt, meticulous autopsy of his key family relationships in Flesh Wounds. The result? We get the sinister and the sensitive, the heart-wrenching and the uplifting, the humorous and the melancholy, the hubris and the intellect — but wait there is more. Never is there a moment in this book where Richard shortchanges the reader. You’ll read it in a couple of days – and feel compelled to do so. 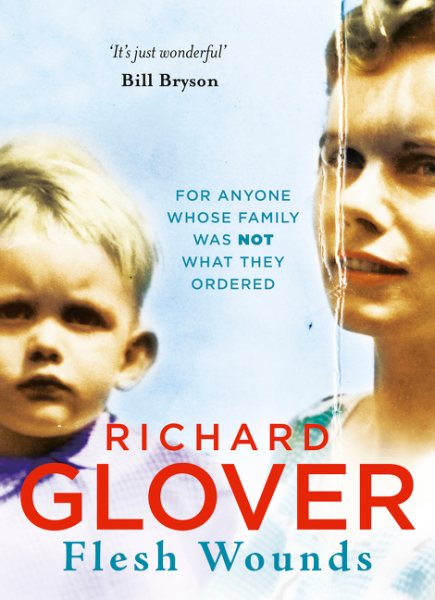 The art of writing that is Richard Glover’s gift sets us up for such compulsion. You can’t help but want to know what comes next and how it will all pan out for Richard. The driving force of the memoir is our growing affection for little Richard, and now, respect for the emotional snakes and ladders games his earlier life has been, in relation to his family roots and how he dealt with them. Richard deserves such success, given the idiosyncratic personality that was his mother, the self-centred narcissism of both his mother and father and the incredible weakness of his father, creates what one suspects runs far deeper than “flesh wounds” for Richard. The humour is fresh and delicious. At times it’s laugh-out-loud episodes akin to a Seinfeld scene – particularly the moments he captures so vividly, like the wicked ways his youngest son reaps revenge on his grandmother. Richard’s dinner party game of “Who’s Got the Weirdest Parents?” further attests to this innate, wicked sense of humour (that apparently is passed down), and one suspects, the humour he also shares with the vibrant and vivacious Debra Oswald. One is reminded of Graeme Simsion’s novel, The Rosie Project, which took us on an emotional roller coaster journey, as does Flesh Wounds. Given the extraordinary success of Simsion’s book, I predict this one also to become an icon of Memoir. Let me be the first to predict a multi-award winner in the making here! Get the book. Read the book. Run!